At the Design and Computation Group, we strive for engaging with specialists in the subjects we take an interest in, allowing us to keep up to date on such subjects, presenting research we have been working on, and maintaining contact with good old friends as well as making new ones. LDAC2019 – Linked Data in Architecture and Construction Week (17 – 21 June 2019) at Beta-i Hub, at Av. Duque de Loulé – 12, 1050-007 Lisbon, Portugal. This year’s LDAC workshop takes place in Lisbon, Portugal, and is locally organized by the Design and Computation Group (DCG) of Faculdade de Arquitetura, Universidade de Lisboa, in partnership with Beta-i. 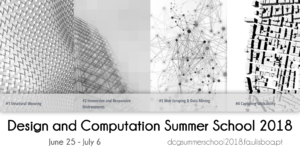 This year’s LDAC will also feature a Summer School (17-19 June), in which the fundamentals of linked data and semantic web technologies are taught in the context of the built environment. This includes exercises and a coding challenge, as well as lectures by experts in (semantic) web technologies for architecture, engineering, and construction. This summer school is limited to 40 people max (first come, first served). Submit a paper of min. 8, max. 14 pages (PDF) at https://easychair.org/conferences/?conf=ldac2019 before the submission deadline (March 3, 2019). Please follow the LNCS template (Word, LaTeX) and make a submission directly via EasyChair. Submissions will be peer-reviewed by the Program Committee. Accepted submissions will be published as part of a separate volume of the CEUR-WS proceedings. Reviews for accepted papers will be made available openly online. The Design Computation Summer School 2018 is an initiative of the Design and Computation Group (DCG) of Faculdade de Arquitetura, Universidade de Lisboa. It will be a space for discussing new ideas and new applications of advanced concepts in architecture and urbanism by exploring the given tools and methods. The main idea of this set of workshops is to share advanced knowledge on the related subjects and get feedback from the participants. We expect to grow our network of highly specialized researchers and expand the use of our methods and tools by providing a hands-on experience. The workshops are also a response to frequent contacts we had for sharing our tools. As most tools are still under development we thought that sharing in a structured workshop format would not just provide the knowledge but also could allow contributions and eventual future collaborations with the participants. We are therefore both sharing and networking. The main goal is to introduce participants to Building Information Modeling (BIM) concepts, to understand the relevance of this methodology to design and construction, terminologies and standards. The secondary goal is to put some of these theories in practice into a BIM model. Room 5.0.8; 2 to 6 p.m.
DCG were in Kyoto last week for monitoring a Workshop on Shape Grammars applied to product design and engineering. The Workshop was held in Kyoto Institute of Technology, from 9th to 11th March 2015, and was sponsored by Kyoto Design Lab. Nearly 30 participants attended the Workshop, mostly Japanese but also from Spain and Turkey. The workshop was led by Professors José Pinto Duarte and Andrew Li, and monitored by DCG members Mário Barros and Eduardo Castro e Costa. José Duarte showed how shape grammars work, and Andrew Li showed how to implement them in his Interpreter application (http://andrew.li/interpreter/index.html). You can download a PDF presentation of the workshop results. The workshop was preceded by presentations from Prof. Xavier Cañavate from Terrassa School of Engineering (EET) of the Universitat Politècnica de Catalunya, Spain, and from Prof. Güzin Konuk from the Mimar Sinan University of Fine Arts in Istambul, Turkey. We would like to thank the staff in KIT for this great opportunity, namely Professor Ryusuke Naka, Professor Tetsuya Sato, and Kazuya Sawada for a most warm welcome to Japan. Synopsis: In product design and engineering, we commonly use computer-based techniques to model and fabricate forms. To develop those forms, we may use parametric or generative methods. Such methods usually involve a programming language (like Java or Python) or a tool like Grasshopper. To designers, these often seem less intuitive than sketching manually. In this workshop, we focus on a technique that combines both the directness of drawing and the generative power of algorithms. We Schedule Site experimental software application to design and fabricate 2D patterns. This workshop is for practitioners and students of design who are interested in digital fabrication, mass customization, and algorithmic design.